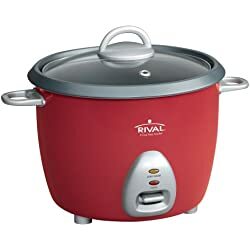 This Rival RC165 8 cup rice cooker has a good price tag for its capacity and is perfect for cooking white rice, decent brown rice, and mixed rice, as well as steaming vegetables. Please note that this cooker may be sometimes labeled on other sites as a “16 Cup” rice cooker, but this is incorrect as this cooker prepares up to 24 cups of cooked white rice, and has an 8 cup raw capacity. This rice cooker like other cheap cookers around this price range simply boils the rice until it is finished and does not use micro-computerized monitoring technology. The result is an average standard batch of rice. Once almost complete, a sensor detects the temperature change when there is little water left and switches the unit into a warm mode. However some report that this warm mode seems to be a little too hot and will crust the bottom portion of the rice if left on too long. So for folks who prefer to keep their rice sitting for a couple of hours in a warming mode…this cooker is not your best choice (see Tiger Rice Cookers). As mentioned above, the Rival RC165 is good for cooking white rice, just as good as any other cooker of this basic style. But for brown rice, due to the rapid boil style this cooker utilizes folks may need to add about 1/4 to 3/4 extra water so that the rice does not come out under-cooked. These measurements vary by grain/variety and will require slight trial and error. Remember that it is best to “under-measure” than “over-measure”. You can always add more water if needed. This Rival 8 cup rice cooker comes with a measuring cup, steaming tray, and plastic rice paddle for scratch-free serving. Overall, this is a good rice cooker for the price. Perfect for once or twice a week use for regular white rice as well as different grains. It is simple to use as mentioned in the pros and frees up the stove for other pots and pans. Unfortunately folks are stuck with just that one red color which may or may not be a good thing. Side note: we will also like to know if the top handle of this Rival RC165 cooker becomes hot…at this time we are not sure. A close competitor to compare this model too is the Aroma 8 Cup “Cool Touch” rice cooker, (plain white color)…see “Aroma Cookers” page.